Too many months have passed since our last update for any explanation or list of excuses for the absence ………….. we are both well, happy and enjoying life. I’m inspired by some lovely photos Allen is producing with his new lens. He is currently participating in Bird A Day 2015 ‘though if we don’t go travelling soon he is going to run out of birds as many of the local species have been ‘used’. The discipline of having to find a different bird each day has been quite a challenge but from my observations I don’t think he is finding it a chore! 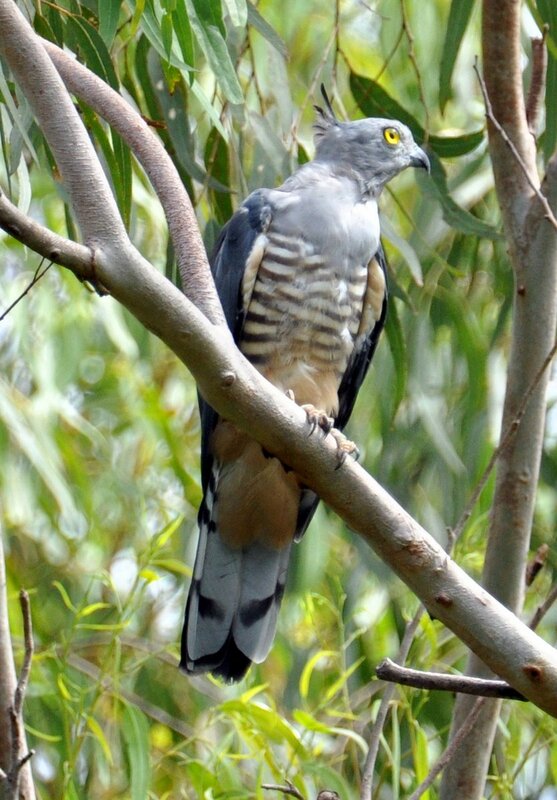 Today’s feature is the handsome Pacific Baza or Crested Hawk which can be frequently heard and sighted around Wild Wings & Swampy Things. The first time I saw one I was alerted to its presence by a disturbance in a nearby Eucalypt. I watched as it repeatedly fell off a branch and fluttered through some leaves, a cunning method of stirring up some insects which form an important part of their diet along with frogs and small reptiles. Those brilliant yellow eyes are apparently able to facilitate the detection of green objects (ref. Penny Olsen “Australian Birds of Prey”) and studies have revealed that Bazas will choose green insects in preference to brown. The last photo was taken on a different day and of a different bird, perhaps a little younger than the other as the barring seems less defined. It is nonetheless in a very typical, watchful pose high in a Eucalypt. We’re really pleased to have so many opportunities to enjoy these beautiful birds – whether they are calling as they soar above us, or hunting for insects in the trees, they are welcome here. 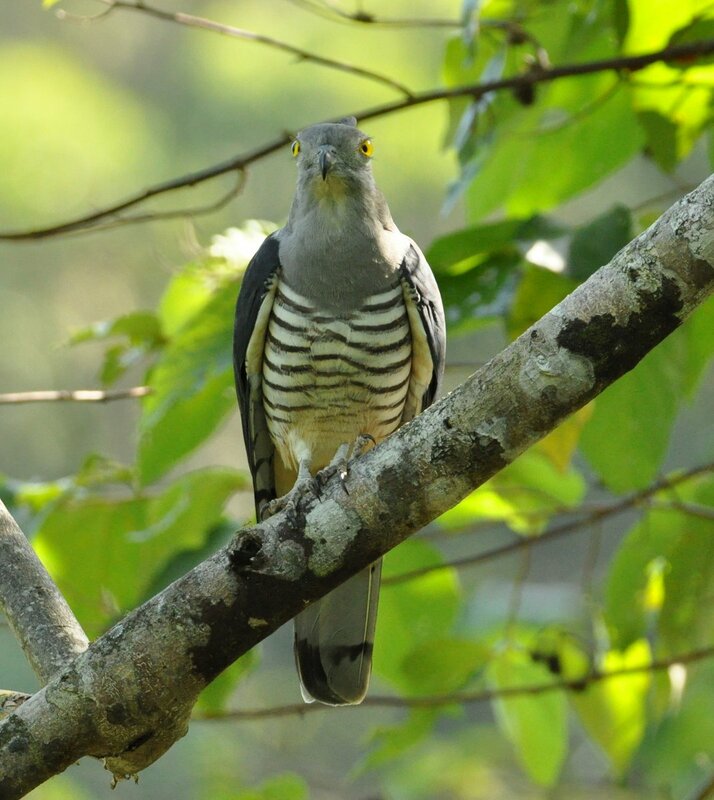 This entry was posted in Bird Observations and tagged Birds of Prey, Daintree Nature Refuge, Pacific Baza. Bookmark the permalink. 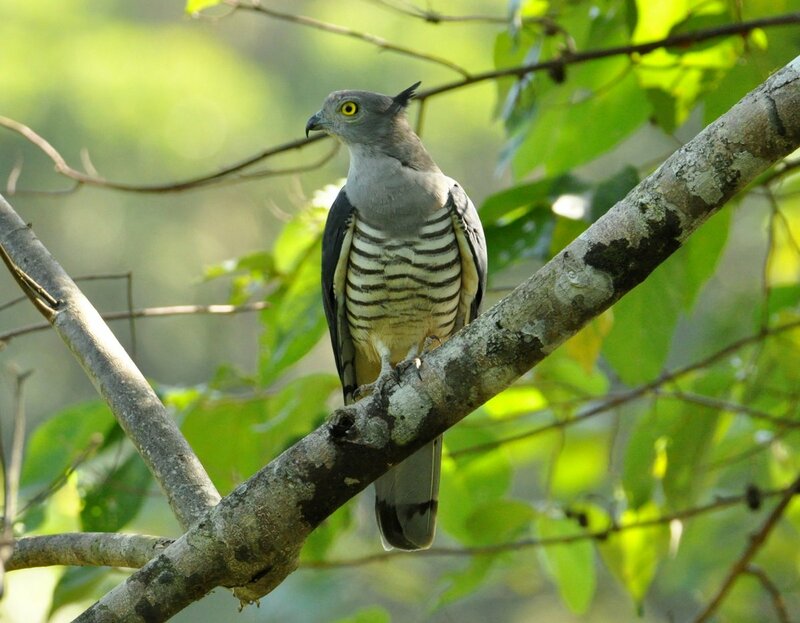 A great bird and photos to return to the blogosphere Barbara. Are we still in the Daintree? Hey Gouldiae,nice to reconnect with you! Yes we are still in the Daintree enjoying the same place; thanks for your kind comment.